The newest addition to ChronoTrack Systems Tag line is the Tri-Tag. The Tri-Tag carries the same powerful UHF RFID tags as the B-Tag in a user friendly compact plastic shell. The innovative plastic shell can be attached to the competitor with a single use strap or neoprene strap. 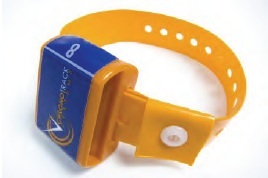 The Tri-Tag gives ChronoTrack timers the opportunity to maximize performance for their races involving triathlon, swimming, and other endurance sports, while offering a single use or reusable tag option.